So there we are, another year over and I am now closed for the festive season. 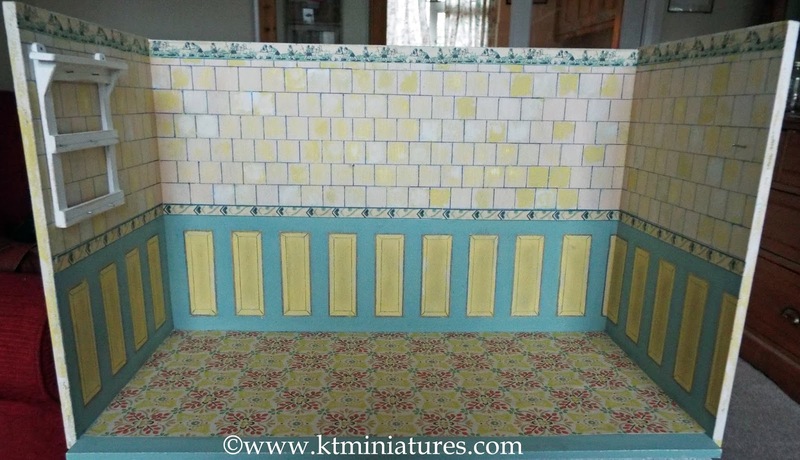 KT Miniatures will be open again on 2nd January 2019. 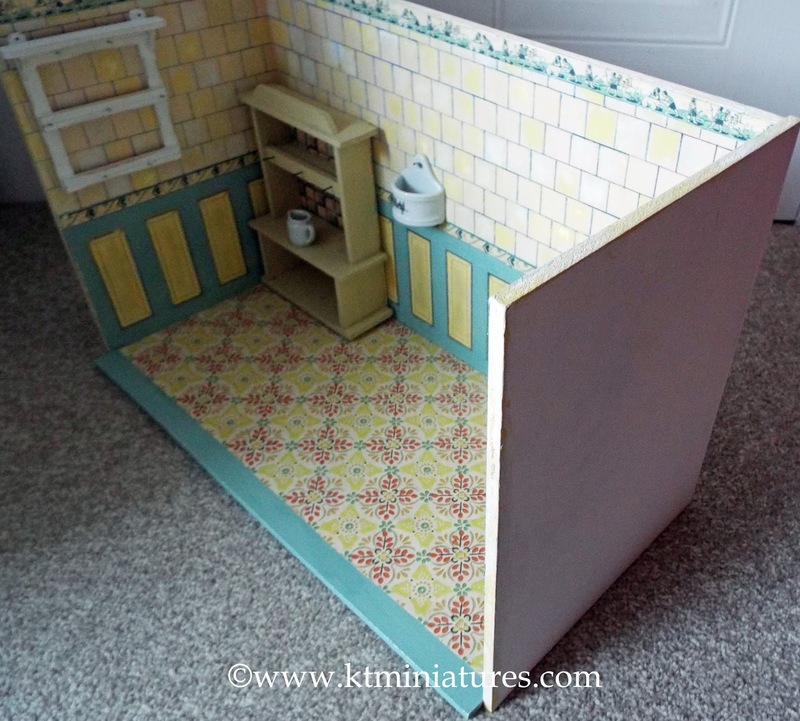 Thank you to everyone for your wonderful friendship, support and interest in KT Miniatures over these past 12 months...and I hope that KT Miniatures Journal has brought a little bit of sunshine into your miniature world. 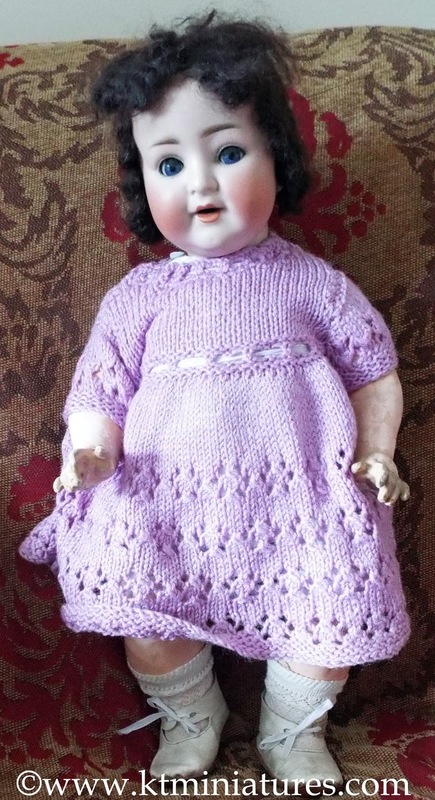 There are at least two exciting events for KT Miniatures being planned for next year (each quite different from each other), but I am not able to reveal all quite yet as there is much more to finalise. 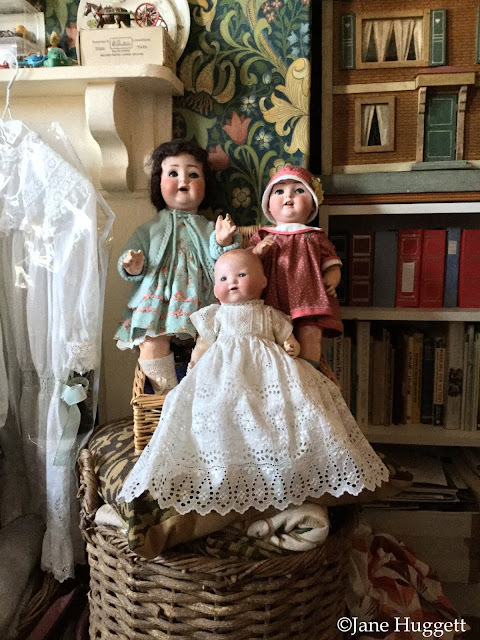 Although I can say, that if you are a massive fan of dolls houses - then do keep Saturday 12th October 2019 free...more about this very soon! 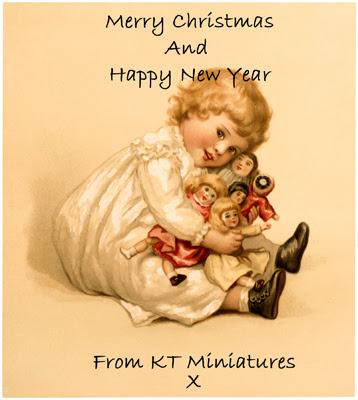 And now I would just like to wish you all a very Happy Christmas from KT Miniatures, and hope that 2019 will be kind to us all. 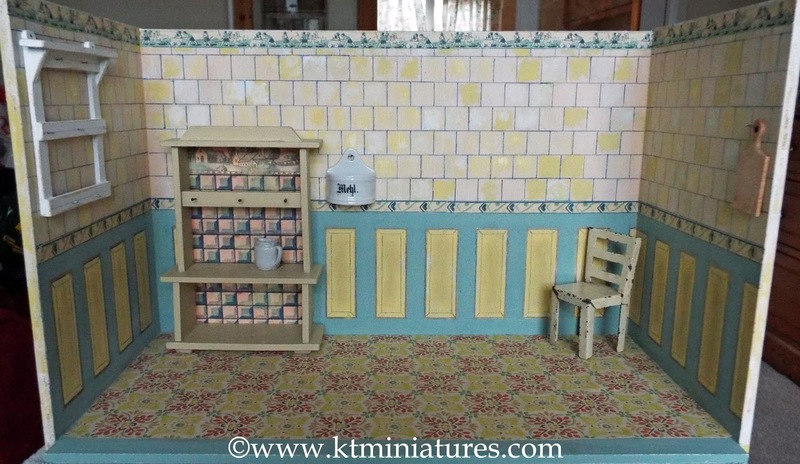 This unique handmade miniature kitchen has just gone up for sale on KT Miniatures website. It is based on the kind of slightly larger scale German miniature kitchens found in the early part of the 20th century. And this is it completed. 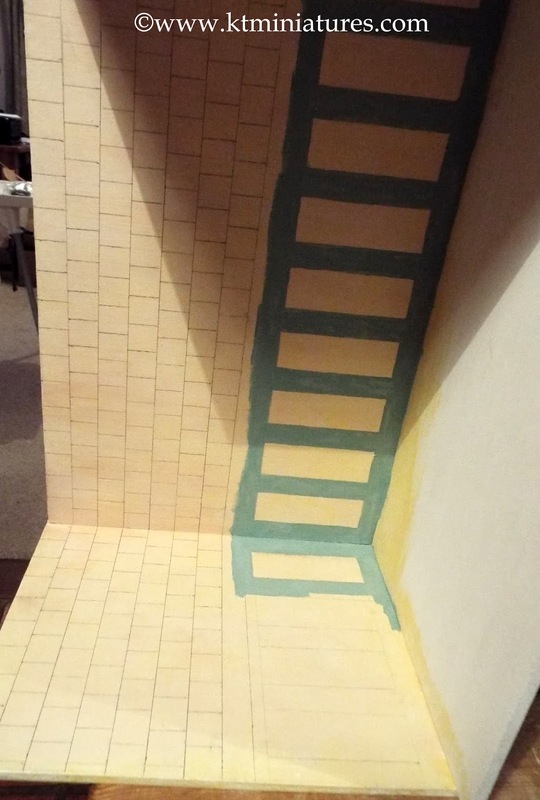 The painting took quite some time before I finally achieved the effect that I wanted. The main carcass is made from MDF and given a white primed finish. 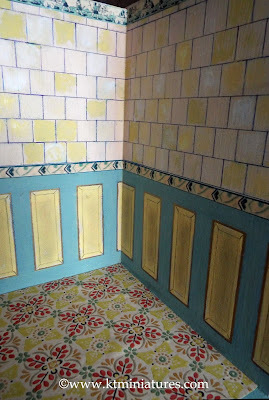 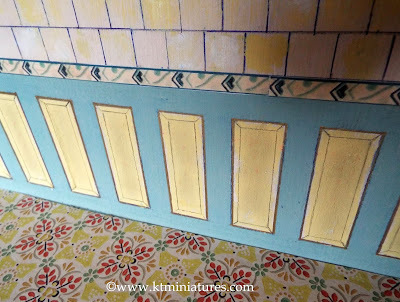 The walls have been given an aged tiled and panelled painted effect...was great fun to do. 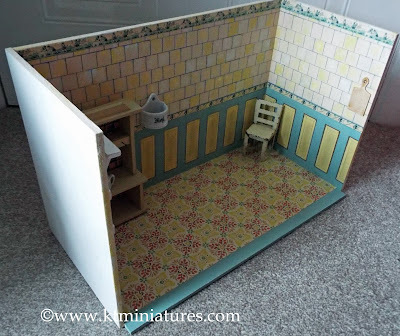 It was loosely based on an antique miniature kitchen photo that I came across when researching miniature kitchens for KT Miniatures 2018 workshop project. The printed paper friezes were based on actual c1910 German dolls house wallpaper and recreated to fit this project. 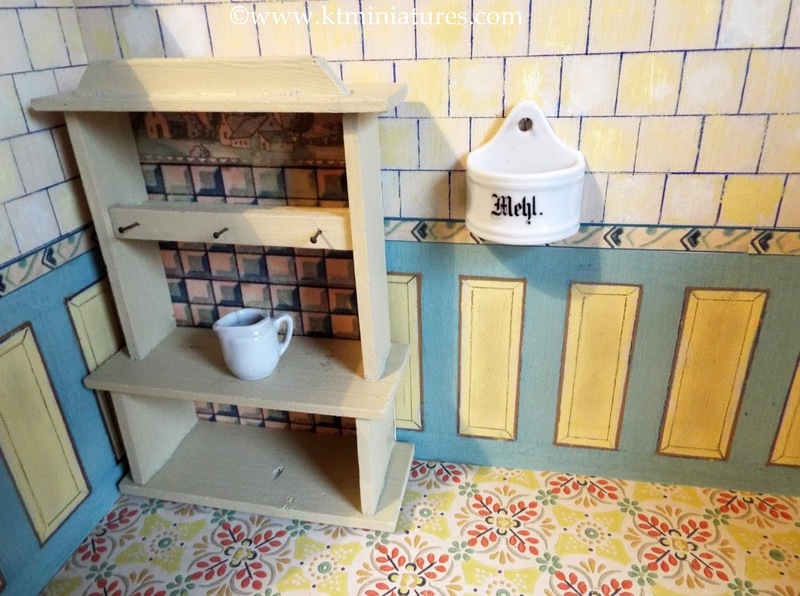 The floor is genuine antique wallpaper, it is stunning and perfect for this little room box. To kick start the collection of fixtures and fittings for this old style kitchen, I have added a number of bits and pieces, including this actual antique German dresser, which came to me already over painted and missing the original back. So I literally gave it a new back of printed paper tiles, based on an identical but original dresser which I just happen to have in my own collection. 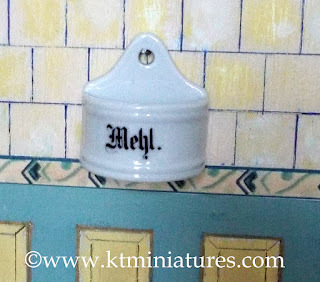 I am including this genuine antique German hanging flour container, which as you can see has the word "Mehl" printed on the front (German for "flour"). So too an antique white china jug. 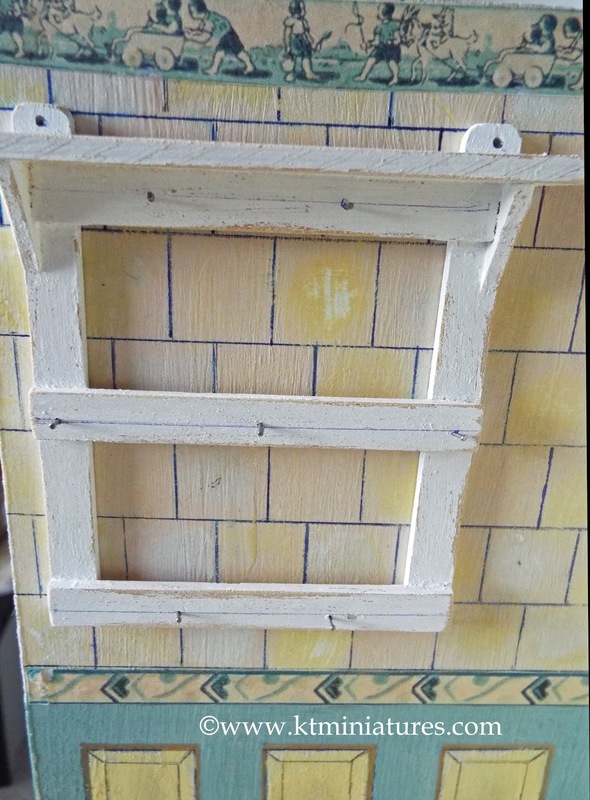 On the left side wall I have created and fixed an old looking wall rack, based on an actual rack seen in an antique German kitchen. Simple but very effective. 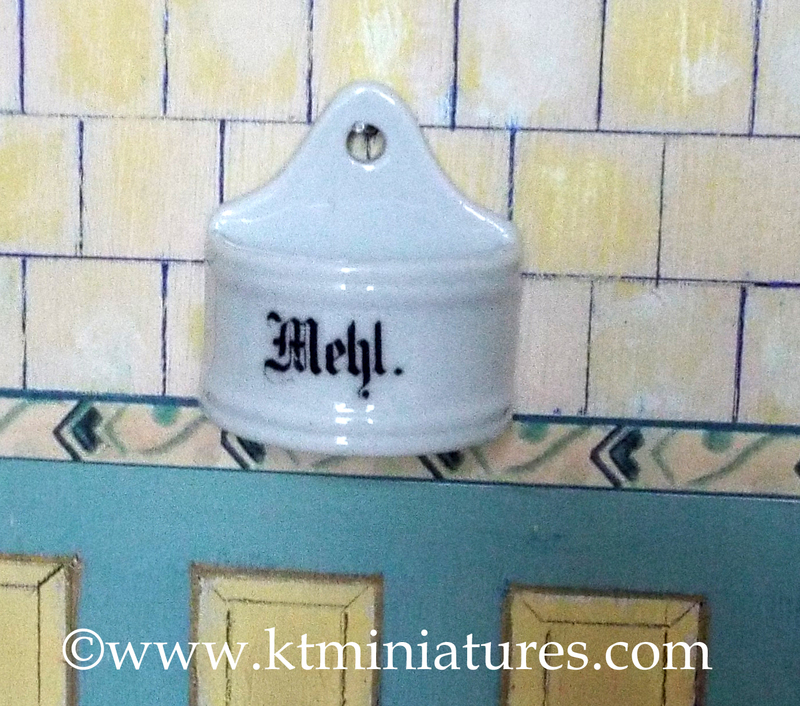 Pans and utensils can be hung from the tiny tack hooks. 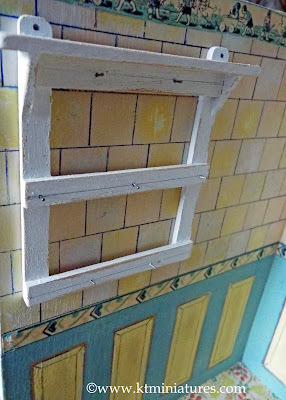 There is also a narrow upper shelf, useful for further storage. 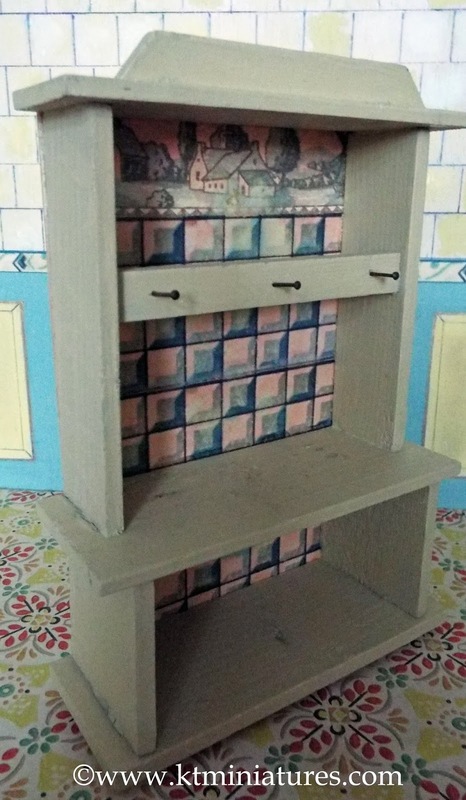 This heavily aged cream painted antique tin chair is included and suits this kitchen well. 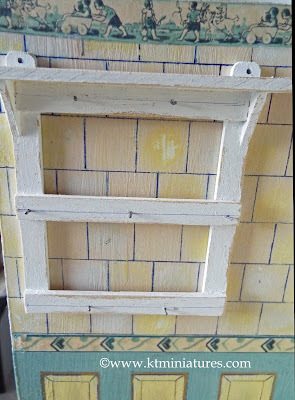 Finally, a simple wooden chopping board has been aged with paint and hangs on the right side wall. 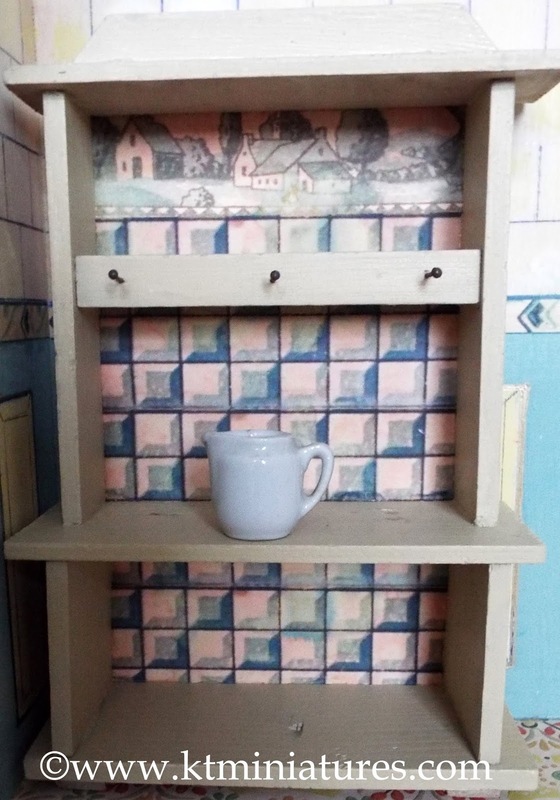 Whoever takes this on, can enjoy filling it with antique miniature kitchenalia. 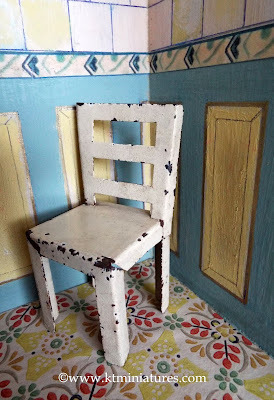 Scale did not matter in the early 1900s toy kitchens, so I would just say go for it...and fill it with whatever takes your fancy, regardless of scale.